Everyone in the beer community is talking about the just-completed Great American Beer Festival. Here in Oregon, there are handshakes all around. Our breweries brought home 25 medals, third on the list behind California (52) and Colorado (46). First, congrats to everyone who won a medal, any kind of medal, whether your brewery resides in Oregon or elsewhere. It's no small task. As Jeff Alworth says in his wrap-up, it's a challenge just getting into the GABF. There are something like 2,500 breweries competing for roughly 600 spots. Ye gods. Some have suggested that the Brewers Association adopt regional competitions to filter entries for the national event. Don't hold your breath. There's a lot of money being made just the way things work now, and there are logistical challenges involved in putting on regional competitions. Near-term changes are unlikely. As I looked at the list of Oregon winners, the first thing I noticed is that Portland breweries are not well-represented. Of the 25 Oregon medals, Portland breweries picked up just six of them...roughly 25 percent. I was surprised by that, given we have more than 50 breweries in the city. It turns out I shouldn't have been. 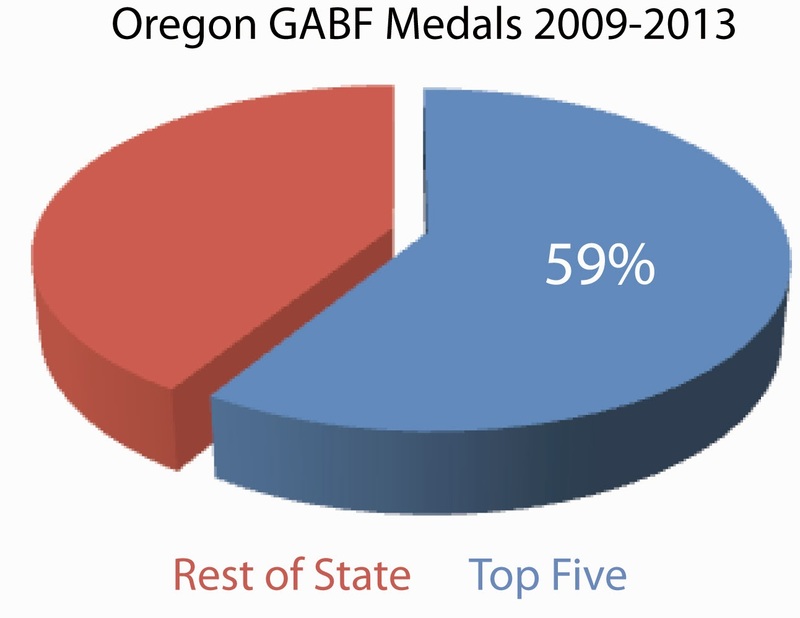 I decided to do an analysis of where Oregon's GABF medal winners have come from over the past five years. Sure, I could have gone back 10 years...or 20. I chose five because I'm most interested in recent history. Be my guest if you want to do a more extensive analysis. The data is out there all the way back to 1983. 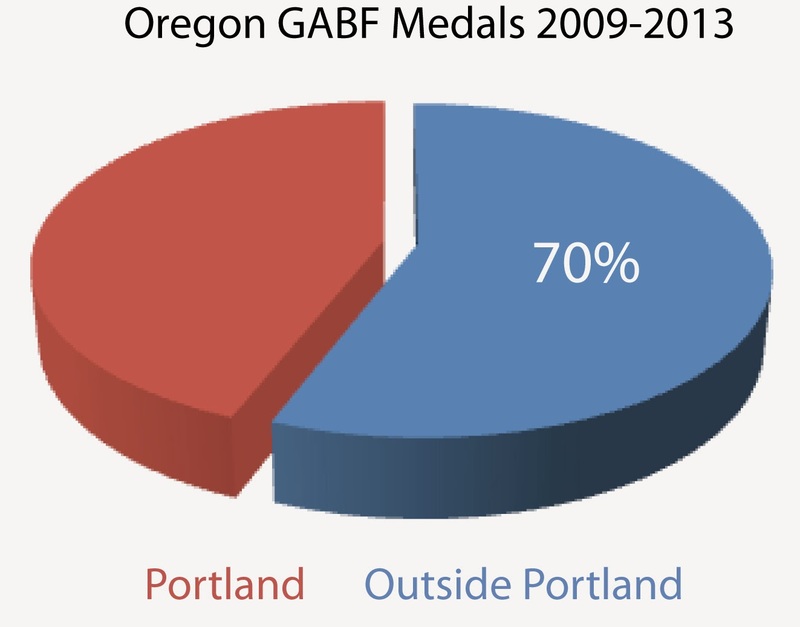 Of the 95 GABF medals Oregon has brought home since 2009, 67 (70 percent, if you prefer) were won by breweries outside Portland. In actual fact, Portland breweries have done fairly well the last two years, winning six medals this year and eight in 2012. Before that, the best recent year was 2009...when Portland breweries won nine of Oregon's 22 medals. The bad years were 2011 (2) and 2010 (3). I wanted to know more. I wondered who the hell is winning all these medals. So I looked through the yearly GABF results and tabulated the number of medals won by the various breweries around the state. I don't want to say I was shocked, but I was surprised. It turns out five breweries have been fairly dominant over the course of the last five years: Barley Brown's (aka Baker City Brewing), Bend Brewing, Deschutes Brewing, Pelican Brewing and Rogue. Together, these five breweries have accounted for 56 (or 59 percent) of the 95 medals GABF medals won by Oregon breweries. Boiling it down further, the top three accounted for 41 of the 95 medals (43 percent). It may come as a surprise to learn that the top medal winner is Barley Brown's of Baker City, which has won 16 medals. Deschutes is next with 13; Pelican has 12. Rounding out the top five, Bend Brewing has eight medals and Rogue has seven. It's hardly a surprise to see Deschutes among the top medal winners. It's a huge operation and they've been making good beer for a long time. The big surprises are Barley Brown's, Bend Brewing and Pelican. These operations are small and two of the three are rather remote. When was the last time you visited Baker City? Pacific City? Alrighty then. In case you're wondering, the top Portland brewery over the last five years, in terms of GABF medals, is Laurelwood with six. Widmer and Breakside both have four. Hopworks and The Commons, which added two this year, both have three. What do these stats mean? 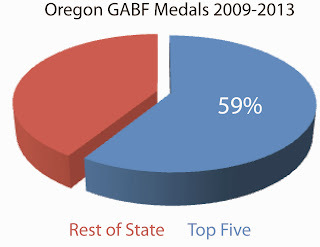 Mostly they mean Oregon's rural brewers have dominated the GABF medal hunt in recent years. Why has this been the case? I have no idea. I was originally thinking about linking Portland's relative lack of success to the fact that style barriers have completely collapsed here. But that seems a bit of a stretch. There has to be more to it. One final point with regard to Barley Brown's/Baker City Brewing. These guys won three golds, two silvers and a bronze this year. They were also named best Very Small Brewing Company and Very Small Brewing Company Brewer. Seeing them win medals in highly competitive categories (like American Style IPA) shouldn't really come as a surprise. Not if you look at their recent history. They're in a groove. As always, I look to culture. By necessity, the GABF competition forces norms. It starts with guidelines, but that only begins to get at the issue--after all, guidelines are available to everyone. What differs between Portland and the rural areas of the state--and I would include Bend in this--is that there is a "Portland style." It's far from static, but it's distinctive. When you have half a city constantly pursuing new beers and new flavors, things move fast. Breweries respond to consumer demand, and when demand evolves, so do beers. In Portland, breweries are famous for being creative, but this is a function of our restive drinking population. In the rural areas, breweries define taste preferences. In the absence of anything else, the good folks of Baker City will default to Barley Brown's flavor palate--which can stay fixed like a laser on the norms of the GABF. Despite the massive wave of breweries in Bend, I'd say they are only beginning to get a "Bend style." Breweries like Bend Brewing can stick with normed beer and please local palates. Pete - do you know how many total OR beers were enterd into GABF, and the percentage of those that were from PDX? It looks like there were about 30 OR breweries in total, and only 12 were from PDX, so PDX winning 25% of the medals isn't far off from what it should be. I'm guessing that the bigger, older breweries from elsewhere in OR (Rogue, Deschutes, Ninkasi, Pelican, and so on...) might have entered more categories, upping their chances of taking a medal home. Widmer didn't enter and Bridgeport really markets beers at lower price points, so the biggest breweries we have in actual contention for these medals are Laurelwood and HUB. Then some of our best breweries (Hair of the Dog, Upright, Cascade) don't seem to enter. Overall we should be proud of our relatively younger and smaller breweries - like Breakside, The Commons and Harvester - who are bringing home medals. I know The Commons only netered 4 beers, so them brining home 2 medals after only being in existence for 2 years is pretty damn impressive. I'm also sure that if you just remove Barley Brown's from the equation that we'd find that PDX breweries are winning GABF medals at a higher rate than these rural OR breweries. It is certainly true that some of Portland's best breweries do not care to enter the GABF. They have their reasons, I'm sure. It's the newer kids who are competing and doing a reasonable job. Still, the rest of the state is doing better. If you remove Barley Browns's 16 medals from the 95 won between 2009 and 2013, you are left with 79. Of those, 56 (70 percent) were won by breweries outside Portland. So removing Barley Brown's doesn't change the five year snapshot at all. If you remove them from just 2013, Portland's medal take is 6 of 19, or 31 percent, which is slightly above the five year average. That's not a significant change in my mind. Regardless of the reason, breweries outside Portland have been better at winning GABF medals in recent times. So if we remove Barlewy Brown's, Portland's medal take is 6 of 19, or 31 percent. Of the 31 Oregon breweries (excluding multiple locations for the same brewery), only 12 were from Portland, or 38%. 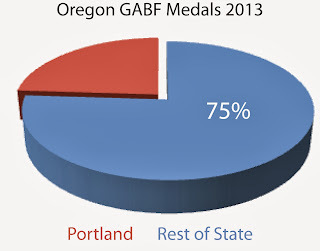 So 38% of the breweries won 31% of the medals - those #'s are relatively close to each other, so it's not like the breweries outside Portland are that much better at winning GABF medals. If we look at #'s of beers entered instead of # of breweries that entered, we might find that Portland only entered 25% of the total Oregon beers entered. If that's the case and we won 25% of the medals (including barley Brown's), then we won at the exact same rate as the breweries outside of Portland. Just look at Barley Brown's vs. The Commons. Between Barley Brown's and Baker City combined, they entered 10 beers and won 3 medals. A 30% win rate. The Commons entered 4 beers and won 2 medals. A 50% win rate. I would say that The Commons is actually better at winning medals than Barley Brown's when you look at those #'s. All I can say is, GO OREGON! We have some awesome breweries established here, I am one proud Oregonian for this. I am also very proud of our local brewery Barley Browns. No matter how you put it, calculate it, or deduct what you want from it, for this little town.. They surely have it going on! Good Job Baker City Brewing Co Crew! I'll certainly grant you Baker City, but calling everything outside Portland "rural Oregon" seems like a stretch to me. But, at any rate, given the selection bias in terms of who participates in GABF; I'm not sure these numbers are anything more than a curiosity. Pacific City and Baker City are certainly rural. If you wish to argue that Bend qualifies as "urban," you'll have to contend with the census, which puts Bend at #7 on the list of cities by size. With respect to the issue of who participates in the GABF and why, that was outside the scope of the piece. 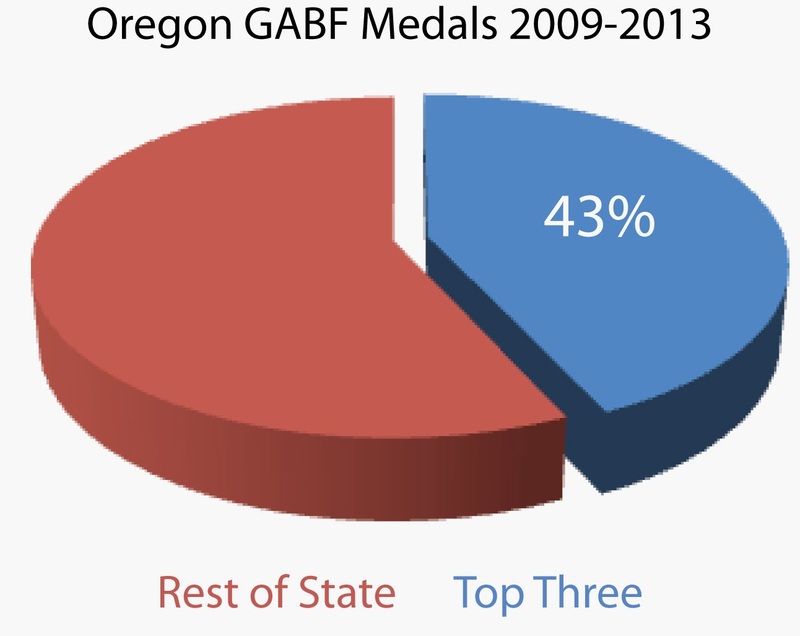 I merely wanted to show where the bulk of Oregon's medals have been won during the last five years. The facts are clear on that. Why is that the case? That's another piece.